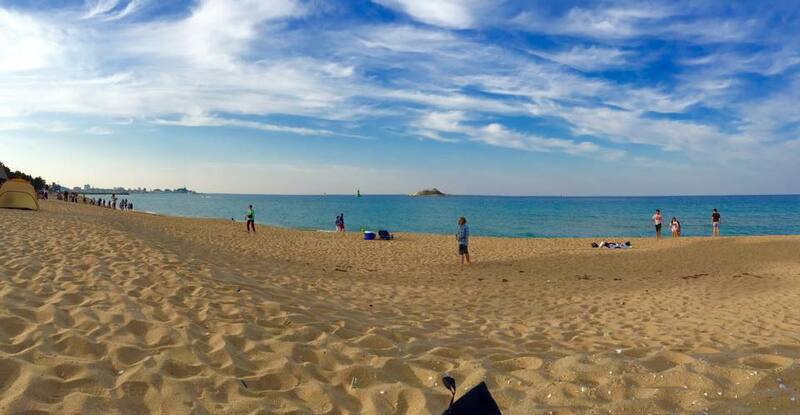 This week I decided to beat the summer heat and head to Sokcho Beach (속초해수욕장). Sokcho beach is a located in the far north east corner of South Korea. 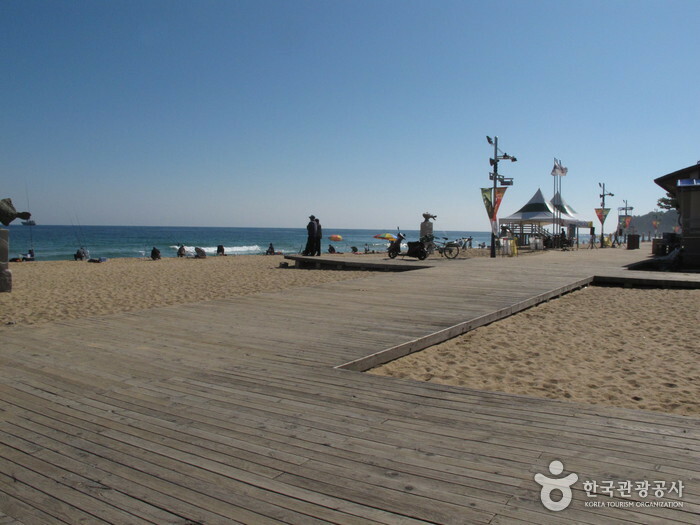 Sokcho beach is a huge tourist spot for many people. It hosts some of the clearest pristine water you can find at a Korean beach. It also is very near Seoraksan (설악산), (which you can read my other article called Seoraksan Adventure) so you can do an adventurous hike then take a relaxing nap on Sokcho beach. We started our journey to Sokcho at the Seoul Express Bus terminal (서울고속버스터미널) on line 3. We expected to get to the bus terminal and just buy a ticket and leave but it wasn’t that easy. We realized that some of the ticket times we wanted were sold out so we had to wait for about 2 hours before we left. I recommend buying a ticket in advance or maybe traveling on weekdays. Once we made it on to the bus the ride took about 5 hours because of the heavy holiday traffic. Although things had not been too great we finally made it to Sokcho bus terminal and walked down to the beach. Once we made it to the beach it was definitely worth the wait. The water was beautiful and the view of the mountains behind us was amazing. As it started to become night time we decided to try and find a cheap motel or hostel to stay in but quickly realized that these places were a lot more expensive than usual. The cheapest motel we found was around 130,000 Won (120 USD). We then stumbled upon Emart which is very close to the beach/bus terminal and all our worries disappeared. Emart had everything we ever wanted. We were able to buy a tent for only 45,000 Won (40 USD) and two sleeping bags. Emart also had an eating area where we ate some affordable and tasty food. 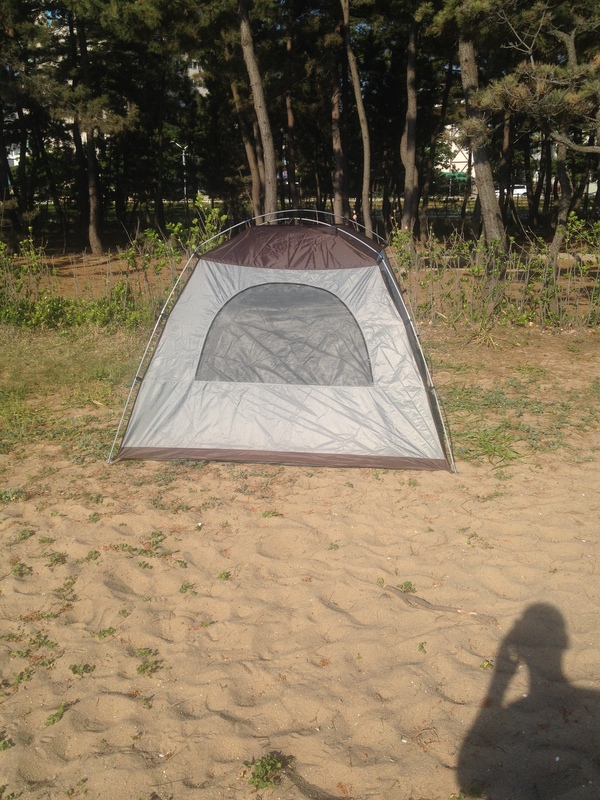 When we got back from Emart we found a nice spot right on the beach and set up our tent. On the beach there were people setting off fireworks and having a great time. It was a really relaxing and nice night on the beach. In the morning we got up and saw the sunrise on the beach and it was an spectacular view. Then we headed off to Seoraksan. To get to Sokcho Beach head to Seoul Express bus terminal on either the light blue line, line 3 or line 7. Once there buy a ticket for Sokcho and you’ll be on your way. At the Sokcho Bus terminal (속초시외버스터미널) you will see a sign to right that says Sokcho beach. Follow the sign to your right or about for about a 5 minute walk and you will be at the beach. To get to Emart start at Sokcho Bus terminal and head the opposite direction of the beach for 3 blocks and Emart will be on your right. It will take about 5 minute walk. It’s pretty big and hard to miss. So you’ll have no trouble finding it. 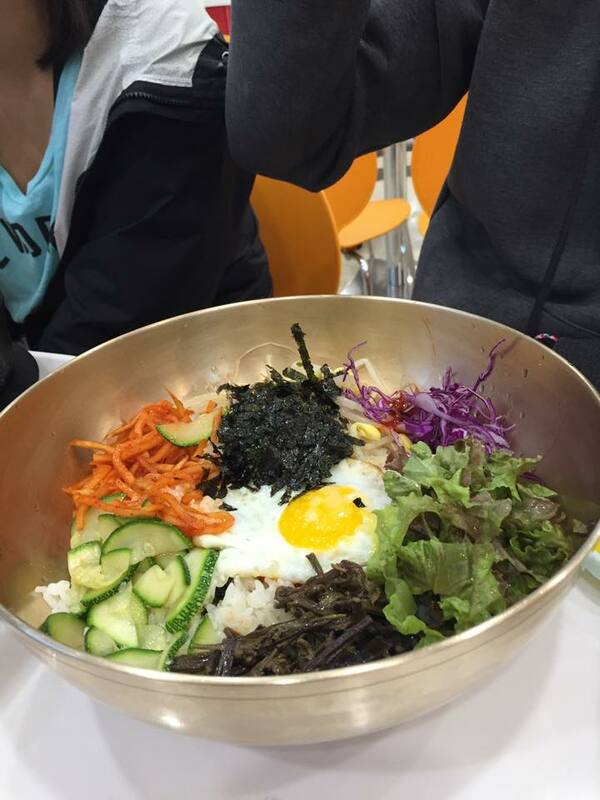 If you have time I highly recommend visiting this part of South Korea. It has many things to do and can be really affordable. You can get a real feel for how Korean camping works and how easy and fun it can be.